Writing is hard. Really hard. I mostly write when I have to write – school or course-related writing or writing in front of my students. I just recently finished writing my dissertation, and, boy, was it hard. The agony of sitting in front of my computer trying to craft a sentence that gets my point across or organize my thoughts into a paragraph that flows smoothly made me want to give up on a daily basis. I am baffled by those who find joy in writing. Writing is just so hard. I know how many of my students feel. I can relate to how it feels to look at a blank page and not to have any idea about what to write or know how to start and then when I do start not know how to keep going. As I write this paragraph, and get distracted with checking my email and Twitter (which I just did before I started writing), I understand why some students always have to make a trip to the bathroom or get up multiple times to sharpen their pencil during writer’s workshop. I know how it feels. Writing is just so very hard. And, yet, here I am starting my own blog and writing my first Slice of Life. I know that writing is hard, but I also know the power of writing. Writing can help us reflect and learn. Through writing we can understand one another. Writing can create change. So, I am stepping out of my comfort zone. By writing more about my teaching I am doing something I am not familiar or comfortable with – writing for the joy. Blogging and writing is a challenge, but I’m hoping from that challenge I will grow as a writer and a teacher. Maybe, someday writing won’t be quite so hard. The goal for our students is that they grow and learn. They, too, need to step out of their comfort zones. If students take risks, try new things, and challenge themselves, not only can their writing benefit, but learning, in general. As teachers, we can encourage students to step out of their comfort zones. We can share stories of others who have done this. There are many children’s books, picture books and biographies, that tell the stories of individuals who took a risk to accomplish something. These stories can open up conversations about risk-taking, failure, persistance, and success. In addition, teachers can model their own attempts to step out of their comfort zone. My decision to blog and write more, even though it’s something I’m not entirely comfortable with, is something I can share with students. Sharing our own struggles with writing and learning is powerful. In the classroom, failure, or more accurately, mistakes should be embraced. Our mistakes help us learn and grow, but students don’t always understand this. We can foster an environment in which students learn from their own and others’ mistakes and persist in achieving success. Writing is hard. Learning is hard. Taking on a challenge is hard. But, remaining in one’s comfort zone is too easy and we risk finding the joy and creating opportunities to grow and learn. Excellent first post for SOL! I recently started blogging and writing for pleasure as well. It's one of the scariest things I've done of late. And extremely rewarding. Your post hits the hearts of many new writers like myself. Thank you for sharing your voice with the world! Come find me at www.schoolteachersuperhero.com I think you'll see we have a few things in common :) Keep going! Stepping out of your comfort zone is a wonderful, empathy-building experience, as you clearly show through your connection to your distracted students. Inspired by my brother I write a minimum of 750 words every day. Most of those words stay in my private journal, but many end up as posts in one form or another. The most difficult thing to do is share. So, kudos to you for taking the leap. I hope that someday writing becomes a joy for you (as it completely is for me). You are right, sharing is not easy. I'm impressed that you have such a great goal. I hope I can be consistent with my writing. Speaking of 750 words/day, you might want to check this out, http://750words.com/. Welcome to the community. By recognizing how hard writing is for you and still challenging yourself, you students will have an excellent teacher and example to follow. Thanks for reading. If I'm asking students to do something which is difficult, I should be doing it myself, too. I've heard of such a thing as writers who find it joyful to write, but I'll confess that I never do. I love wrestling with a piece when I've got something I think is worth writing. But it's always hard work and it never comes out quite the way I intend for it to or hope it will. I feel the same way about my writing. I could revise my writing pieces endlessly. It helps so much to know that others struggle with writing, too. Welcome to slice of life Tuesdays. I hope you'll find support here for risk-taking and for just the fun of reading what others share. Since you're a reader too, you may want to join the Monday group too called "It's Monday, What Are You Reading", supported by two different blogs, Teach Mentor Texts and Unleashing Readers. You accomplished so much & that means to me that you've written and written and written some more, but mostly academia pieces. Perhaps the more personal writing will be more fun, maybe not, but congratulations for starting! Thanks for your suggestions. 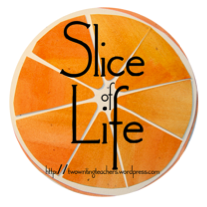 I'm excited to be a part of Slice of Life Tuesdays! Welcome to our slicing community. I was petrified when I wrote my first slice and without the support of a great group of students, I wouldn't have gone public with my writing. It's been an exciting journey. So glad you're stepping out of your comfort zone. It's hard work, but it's worth it. Sharing one's writing is scary. I've been a part of a writing group in the past and never enjoyed sharing. I'm amazed that I'm sharing here in public. Good for you for getting over your fear. Welcome! I applaud you for taking this challenge. Writing will get easier, but it will always be hard. Most things that are worthwhile are difficult. You've taken a big first step! Welcome to the world of slicing! It's a lovely, supportive community of writers who will agree that writing is hard. All I have to do is push "publish" and I instantly think of three or four or even a dozen ways I could have revised my post! And I'm on the "new" end with 250 posts (I never dreamed I would get past 10!)! Congratulations! You are on a great learning journey! Thank you. I am just hoping to get to week two, but it is so encouraging to hear how far you have come with your posts. I do love the community already! I'm glad you're diving-in and joining our writing community seeing as writing feels hard to you. I hope you'll stick with us and come back every Tuesday. In time, I have a feeling you'll find the joy in writing. I'm looking forward to coming back next week!